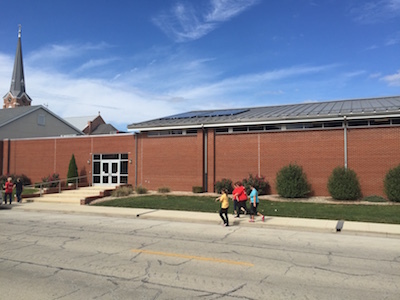 One of the newest of the Illinois Solar Schools is at the St Rose School in St Rose, Illinois. Matt Scheibel is the lead teacher on the project. This project was funded by a grant from Illinois Clean Energy Community Foundation that funded 90% of the project cost. As you can see the panels are highly visible to students. 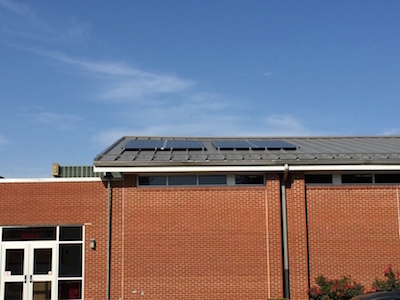 This system generates electricity for the school and is connected to the Ameren grid. It is visible and yet it fits in nicely with the roofline. Students entering the school can easily see the panels and yet they will not collect water or snow and ice will easily melt and roll off of the panels because of the angle at which the panels were installed. This entry was posted on Monday, November 14th, 2016 at 5:20 pm and is filed under Illinois . You can follow any responses to this entry through the RSS 2.0 feed. You can leave a response, or trackback from your own site.